LILONGWE, Jul 3 2013 (IPS) - Charity Salima, 54, has helped to deliver over 4,000 babies in her maternity clinic in Area 23 – one of Malawi’s poorest and most populous townships – and has yet to record a single pregnancy-related death. “I used to witness pregnant women scramble for public transport or hitchhike for a lift just to reach a hospital. In most cases, some would die or lose their babies or develop post-delivery complications that could have been avoided if they had transport and got timely medical help,” Salima tells IPS. Salima used to work as a research nurse. But in 2008 she quit her job to set up her clinic, Achikondi Women Community Friendly Services, in a rented house near Malawi’s capital, Lilongwe. And thanks to the help of the National Organisation of Nurses, a solidarity fund for retired nurses and midwives, which donated an ambulance to her clinic, she has been saving lives ever since. “In Malawi, just like many African communities, when a woman is pregnant, everyone is anxious and filled with fear because they have seen so many women die while giving birth. And yet in developed countries, when a woman is pregnant, she and her family celebrate and are truly expectant,” says Salima. The Ministry of Health puts it simply: 16 women die every day in Malawi from preventable pregnancy-related complications. The country is behind on delivering two of the key United Nations Millennium Development Goals (MDGs) – reducing maternal deaths by 75 percent by 2015, and ensuring universal access to reproductive healthcare. Eight MDGs were adopted by all U.N. member states in 2000, and aim to curb poverty, disease and gender inequality by 2015. But Salima’s clinic and her maternal health success rate here may prove a model for Malawi as the country grapples with saving the lives of its pregnant mothers. 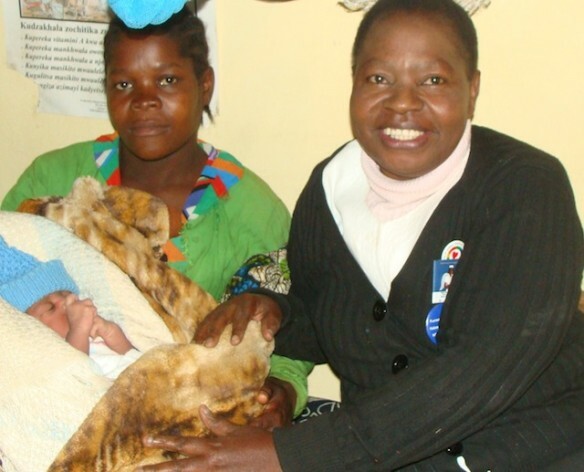 Her methods to combat maternal mortality are simple and low cost. She encourages women to grow vegetable gardens to increase the diversity in their diet, and she registers every pregnant woman in the community so that she can monitor their pregnancy. Her strategies, she says, have helped her identify high-risk pregnant women within the community, who in turn are referred to the main hospital in Lilongwe for treatment. “The other thing we have been doing is to change cultural beliefs in our community that play a major role in maternal deaths, like the belief that if a woman has obstructed labour, it’s a sign of infidelity,” she says. Salima offers a complete range of other services at the clinic, including outpatient services for children under five. Her clinic, however, is not for free. Patients pay a fee of about three dollars to help cover the cost of medicines from the government’s central medical stores. National coordinator for the Malawi Safe Motherhood Programme, Dorothy Ngoma, says that although recent trends show a decline in maternal mortality – from 675 deaths per 100,000 live births from 2006 to 2010, to 460 deaths per 100,000 live births in 2012 – Malawi still has a lot of work to do to meet the MDG on reducing maternal mortality. The Malawi Safe Motherhood Programme is trying to replicate some of the practices in Salima’s clinic. “From an advocacy point of view, we have taken on board initiatives such as Salima’s in our programmes and we are mobilising resources to build waiting homes for pregnant women who live far from health facilities,” says Ngoma. In addition, the programme has recruited 200 young women from 20 districts across the country for an 18-month midwife-training programme. Upon graduation, the midwives will work for their respective communities for five years. “The aim is to ensure that mothers do not travel long distances to seek maternal healthcare services, thereby averting possible pregnancy complications,” Ngoma says. But as word of Salima’s success spreads, it brings with it challenges too. “I have more and more people coming to my clinic but I don’t have enough volunteers with the needed skills to meet the demand,” Salima says.